Exclusive to Pergola Jack. Notched full sized headers without bulky metal hardware. Seamless integration of joists, header, and posts. Use of 2x4's as opposed to the standard 1x2's. Inimitable beauty and strength; others simply do not compare. Pergola Jack is the top Custom pergola and outdoor living space builder in the oklahoma city (okc) & Surrounding areas. Outdoor living spaces by Pergola Jack are built with aN uncompromising passion for a lifetime of outdoor living enjoyment. Listen to the rain under our translucent SunTuf roofing system designed for protection from the elements, while allowing the sun, moon and stars to shine through. Enjoy your pergola all year long regardless of weather. 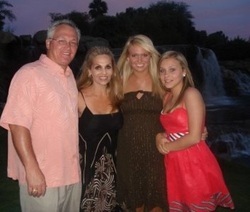 I am happily married to my beautiful wife Tami, with two wonderful and beautiful daughters Candace and Caitlin. I have lived in Oklahoma for 16 years and began building pergolas and outdoor kitchens +20 years ago. Designing and building pergolas/outdoor kitchens has always been a passion of mine. Let me be the person to design your dream sanctuary where your family can gather and have fun.